Subsequent to the high level review of the status of vector borne diseases with 20 endemic states in the country, JP Nadda, Union Minister of Health and Family Welfare chaired a meeting to review the preparedness of various agencies to prevent and manage vector borne diseases in the National Capital recently. Bipin Bihari Singh, Mayor, East Delhi Municipal Corporation (EDMC), Preeti Sudan, Secretary (Health), Promila Gupta, DGHS, Commissioners of various Municipal Corporations, representatives and senior officers from Delhi Government and Municipal Corporations of Delhi were also present during the meeting. Emphasising the need for adequate early preparedness for management of vector borne diseases, Nadda advised the agencies to create a separate registry for the cases originating and being treated in Delhi. He said the focus should be on active case finding for source identification and reduction of vectors and transmission. Nadda further said that there should be no shortage of diagnostic kits, drugs, testing labs, manpower and funds. Awareness being the key to prevention of many diseases, Nadda stressed on the importance of conducting focussed and intensive IEC campaigns and sustaining them through the monsoon season, especially at the time of onset of monsoon. During the meeting the Health Minister directed the officers to conduct supervisory visits to various hospitals in Delhi for assessing the situation, preparedness and to provide on the spot technical guidance to the health authorities. 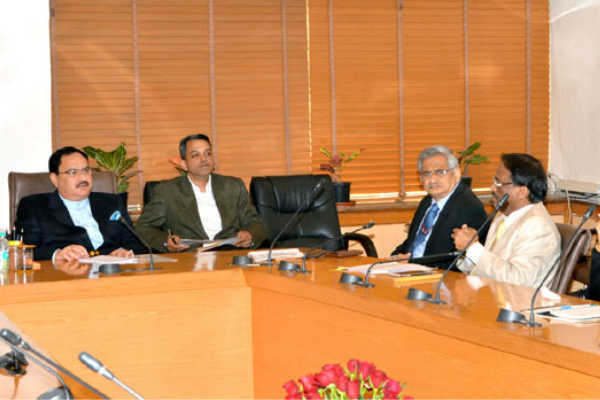 Sanjeeva Kumar (AS), Manoj Jhalani (AS & MD), Vikas Sheel (JS), Lav Aggarwal (JS) and other senior officers of the Union Health Ministry, National Vector-Borne Disease Control Programme (NVBDCP), National Centre for Disease Control (NCDC) were also present in the meeting .